Take a look in our wide collection of designer dressing tables and find the perfect for your home. We offer extensive selection to cater for all tastes, styles and sizes required. 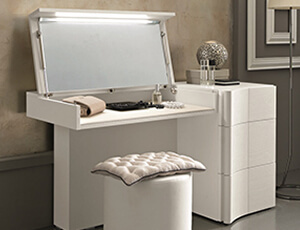 In addition to these traditional styles there is a wide choice of contemporary stylish dressing tables. Dressing table is available in wooden, high gloss, mahogany, Italian, walnut, mirrored, painted, oak, pine, white, light wood, dark wood.